How to Apply for Aid. Determine your eligibility for need-based aid from the federal or state government as well as Drew University (available only to undergraduate students). Receive a low-interest student loan. The earlier the U.S. Department of Education’s Central Processing System receives the application, the sooner the financial aid process can begin. The FAFSA becomes available on October 1 for the following academic year. To receive maximum consideration for need-based or merit scholarships, we encourage you to file the FAFSA by February 15. It is important to file early because some financial aid is given on a first-come, first-served basis. You will need to file the FAFSA each year you are enrolled in school. Obtain your FSA ID online at fsaid.ed.gov. You and your parent or guardian must each apply for an FSA ID in order to sign your FAFSA. Complete the Free Application for Federal Student Aid (FAFSA) online at fafsa.gov. Step 6 (Step 5 for online version) of the FAFSA requires a Federal School Code. Drew’s is 002603. Submit the FAFSA. The earlier the U.S. Department of Education’s Central Processing System receives the application, the sooner the financial aid process can begin. All candidates who file the FAFSA are automatically considered for all funds for which they are eligible. The FAFSA is required of undergraduate students at Drew who are interested in federal and state student grants, Work-Study, Direct Subsidized, Direct Unsubsidized and other student loans and need-based financial assistance from Drew University. Information required by this form includes student and parent income tax information from the previous year, business and investment information and the student’s driver’s license number. The FAFSA is required of graduate students at Drew who are interested in Work-Study, Direct Unsubsidized and other student loans. Information required by this form includes student and spouse income tax information from the previous year, business and investment information and the student’s driver’s license number. Lean more about financial aid for graduate students. The FAFSA is required of theological students at Drew who are interested in Work/Study, Direct Unsubsidized and other student loans. Information required by this form includes student and spouse tax information from the previous year, business and investment information and the student’s driver’s license number. • The FAFSA submission deadline for returning CLA, Caspersen and Theological students is April 15. • Financial aid awards for the upcoming academic year are available for returning CLA, Caspersen and Theological students on TreeHouse beginning in June. • Drew merit scholarships are awarded at the time of admission. These scholarships will be the same for each semester a student is enrolled full time at Drew (up to eight semesters) as long as Satisfactory Academic Progress is achieved. • CLA students must be enrolled full time in order to be eligible for any Drew University grants and/or scholarships. Federal and state aid eligibility is affected by enrollment as well. • Students must maintain Satisfactory Academic Progress to be eligible for any financial aid at Drew University. • Returning students who are eligible for the New Jersey Higher Education Student Assistance Authority Tuition Aid Grants (TAG) must submit their FAFSA by April 15. In addition to the FAFSA, students must complete a supplemental application by logging into their account at www.hesaa.org. Admission to Drew is based solely on academic merit and extracurricular achievement. If you are admitted to the college and demonstrate financial need, you can expect financial assistance in the form of a “package,” which may consist of grants, work opportunities and low-interest loans. It is Drew’s policy to award grants first, recommend employment second, and suggest loans as the last part of the package. One-half of a student’s annual grant award and loan amount is credited to the student’s account each semester. Those with Federal Work-Study jobs or other campus employment receive regular paychecks for time worked. Work-Study is not credited to the student’s account. Aid packages for returning students are based in part on academic performance. All financial aid packages are subject to certain terms and conditions. The Financial Aid Award Agreement is generated by Drew University and is available to you before each academic year to inform you of the financial aid for the coming year. You must formally accept your award in order to receive your aid. I understand that my aid eligibility is based on the financial aid information provided by me and/or my family and that it is subject to adjustment or cancellation if errors are subsequently discovered. I understand that if the Office of Financial Assistance must correct information I originally reported, my eligibility for the awards shown may change. I understand that my aid was determined in accordance with laws, regulations, and appropriations (existing or anticipated) of the U.S. Congress, Drew University, and other donors and is subject to adjustment or cancellation if changes occur in these laws, regulations, or appropriations during the period of my award. I agree to notify the Office of Financial Assistance in writing of the sources and amounts of any financial assistance I receive that do not appear on my award notice. I further understand that if this additional assistance reduces my financial aid eligibility, funds awarded to me may be adjusted accordingly. I understand that my acceptance of a particular type of aid, such as a scholarship, authorizes the Office of Financial Assistance to release information that may be requested by the donor, but in keeping with the provisions of the Family Educational Privacy Act of 1974. I understand that if I withdraw from the university after receiving my financial aid but before the end of a term, I may be expected to repay the university that portion of my aid funds for which I am no longer eligible. I understand that if the financial aid accepted by me is less than my statement of charges that I and/or my family will be required to pay the difference on my student bill. I understand that I am responsible for making the appropriate application(s) for the loan(s) included in my package. If I choose not to borrow, I will be responsible for covering the amount through other means. I understand that any need-based financial aid I receive may change as a result of a change in my housing status. *This only applies to students in the College of Liberal Arts. 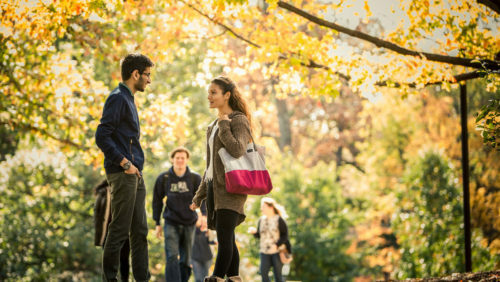 To receive any federal, state and Drew University financial aid (including need-based grants and merit scholarships), you must make Satisfactory Academic Progress (SAP) as defined by the U.S. Department of Education and Drew University institutional guidelines. All Drew University students must meet the criteria stated in the policy regardless of whether or not they previously received financial aid. The requirements apply to part-time as well as full-time students for all semesters of enrollment within an academic year, including those semesters for which no financial aid was granted. Evaluation of SAP is made at the conclusion of each academic term once grades are posted in the university system. This review looks at all courses attempted and earned, GPA and the student’s pace toward graduation. The Drew University SAP requirements, as well as the appeal process for students who fail to meet them, can be found in our online catalog. Undergraduate students are expected to maintain full-time registration. (Full-time registration is 12 credits or more per semester.) Students enrolled for less than 12 credits in the final semester of their senior year may receive financial aid (including Drew scholarships) on a prorated basis. Please visit the Office of Financial Assistance if you are planning on enrolling less than full time. To complete the degree in the normal eight semesters, a student must average 16 credits per semester. Unless an appeal is granted by the Financial Aid Academic Progress Appeals Committee, recipients of Drew scholarships are limited to a maximum of four years of institutional assistance as full-time students; years of study at other institutions are counted toward the four-year total. In no case may a full-time student expect to spend more than 10 semesters earning a degree, unless granted an exception to the rule by the Committee on Academic Standing. Students must maintain, after two years, the grade-point average required for graduation (2.0) to receive financial assistance. If a student is placed on required leave, he or she is not eligible for assistance during that period. A student can re-establish his or her eligibility for financial assistance through an interview with the dean of student life and an academic progress petition to the Financial Aid Academic Progress Appeals Committee. To accept your financial aid, you will be directed to Drew’s student self-service system, TreeHouse. You may be prompted to log in using uLogin. If you have not yet activated your uLogin, you must do so before proceeding. Before you continue to TreeHouse you may want to watch this short video to learn more. Drew’s FAFSA code is 002603.